Voter fraud isn't just confined to the political arena. 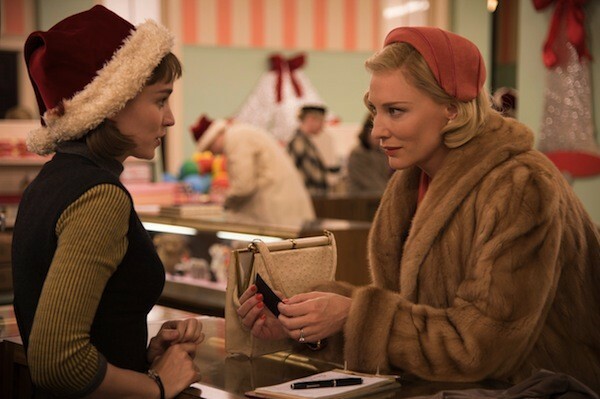 Take the case of Carol, The Weinstein Company's best bet during the current awards season. Seeking to improve her odds, the outfit has been pushing co-star Rooney Mara hard in the Best Supporting Actress category while citing Cate Blanchett for Best Actress. Never mind that Mara and Blanchett are both leads, or that Mara probably racks up the most screen time of the pair. Some organizations, such as the Hollywood Foreign Press with its Golden Globes, have admirably ignored Harvey Weinstein's latest bout of foolishness and nominated both actresses as leads, but others (Broadcast Film Critics Association, Screen Actors Guild) have shamefully allowed themselves to be bullied, unquestioningly taking their marching orders from the studio and absurdly placing Mara in Supporting. How this will play out with the Oscars remains to be seen, but for now, just rest assured that both actresses are formidable, and that the film itself is one of the finest of the year. Based on Patricia Highsmith's novel The Price of Salt, it proves to be a perfect bookend piece to director Todd Haynes' 2002 Far from Heaven, merely one of the great motion pictures of the 2000s. This one also looks at the difficulties endured by idiosyncratic women in the 1950s, those who refused to allow societal taboos to throw a straightjacket on their independence or desires. Blanchett plays the title character, a mother and recent divorcee who comes into contact with a department store clerk named Therese (Mara). The women are immediately attracted to each other, but they move cautiously, aware of the prejudiced and puritanical attitudes surrounding them. Carol is the year's most affecting love story, blessed with exquisite cinematography by Edward Lachman, a gorgeous score by the often overlooked Carter Burwell, Haynes' fine attention to period detail, and not one but two leading performances full of empathy, grace and aching tenderness.